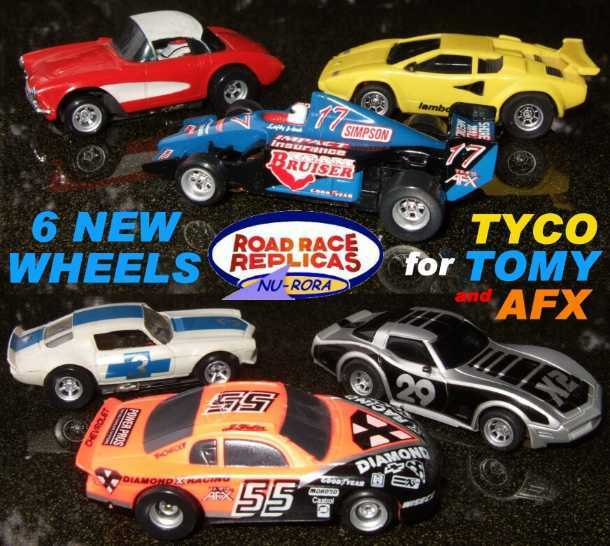 NEW AFX, TYCO and TOMY WHEELS! New compound is stickyer than the old and lasts for years! Same as old #121 Low Profiles but new material and wider. flow properties making for a truer running tire. Radius edges give a more realistic looking tire too! 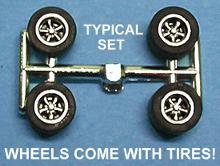 A Complete Set of chrome wheels and supertraction tires for your T-jet SLOT CARS! For use on your original Aurora Thunderjet, M-Motoring, or any H.O. 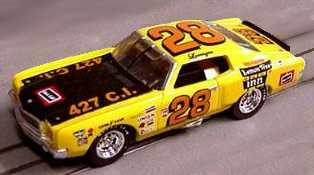 slot car with .062 axles. Wheels are injection molded plastic with bright metallized chrome plating, includes a pair of specially designed front and rear hubs that come with dual width front and rear supertraction wide black tires.NOT FOR USE WITH WHEEL PRESSES! Closed end design on hubs are made to fit the common standard T-jet 7/8" long axles. 3R Wheels and tires are .40 DIA., almost the same diameter as std. 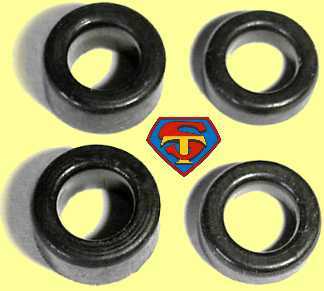 Tjet skinny tires so no special body modifications are required for cars with open wheel wells.....for just $4.00! !!! NOT FOR USE WITH WHEEL PRESSES !!! Pick any of the above colors to paint in the center! CENTER Colors we'll paint are: gray, black, or gold - $6.00 a set. Just add -2 after the number (eg. 815-2). the entire center will be black, not the background! NOT FOR USE WITH WHEEL PRESSES! to offer RWL tires for quite a while. Raised white lettered tires for 3R wheels. ALL RWL tires are $5.00 for a set of 4 tires. 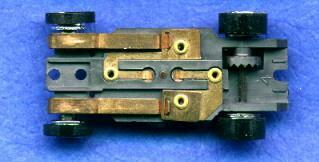 #821 NARROW wheels comes on a sprue as shown below. These are perfect for those narrow bodied cars, or cars with overlapping fenders! Come with low pros on the front and "slicks" on the rear. CHROME #315 axles - $1.50 pr. Uses std. T-jet tires or 101 and 103 silicone tires. 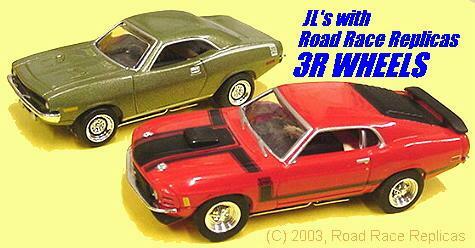 Make your Mach1s or other T-jets look like factory wheels but with some details! Make your Chevys or other T-jets look like factory wheels but with some details! NEW #2507 TRUCK WHEELS and TIRES in RED, YELLOW, BLACK and also CHROME! The racing T/A look of the late 60's and early 70's. to match the 69 Sunoco Camaro wheels. NO NEED for those hard poor-traction 1960's SKINNY RUBBER TIRES and tiny wheels ANYMORE! 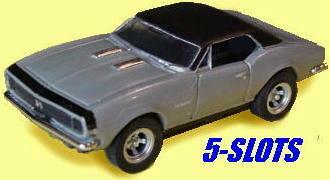 Get the traction and performance that makes your slot cars FUN TO DRIVE! LOW PROFILE TIRES for 3R wheels! 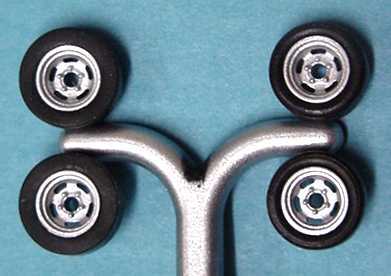 These wheels are NOS leftovers that are the classic chrome small hub wheel found on most T- jets. Can be used with #101 silicon tires. These wheels are NOS leftovers that are the classic chrome hub found on hot rods, F-1s and Indy cars. Comes with hard rubber tires but can be used with #102 silicon tires. 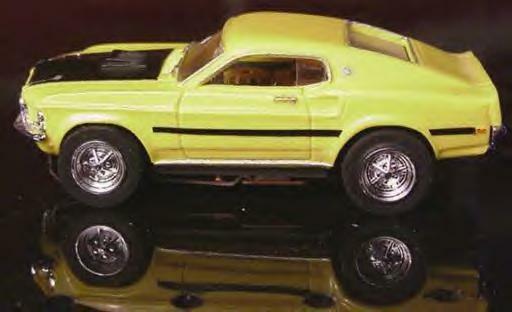 SAME AS ABOVE but ALL YELLOW WHEELS and "CASTLE-EDGE" tires. All items are subject to availability. Prices subject to change.